I decided to double-up Rosie's 1 month check-up and Patrick's 2 year check-up since they fell in the same week--and frankly, one trip to the doc for two kids seemed better than two different trips did. 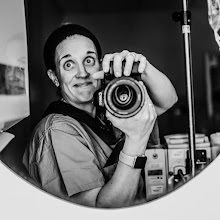 However, as ambitious as it was to schedule them at the same time, I did bring Mike with me so we could tag-team both kiddos in the teeny tiny exam room. I blogged earlier this week about Rosie at 1 month and Patrick at 2 years old. I actually always like taking the burritos to the doc to see how much they've "officially" grown (and not just my mom stats!) and all that jazz. I admit it, I'm a stats whore. I posted the above pic earlier this week about how he's all smiles now, but come Thursday he'll be singing a different tune about his shots. However, those tears are TOTALLY worth it--right buddy?!! Yes, they are (and see here why we think so). 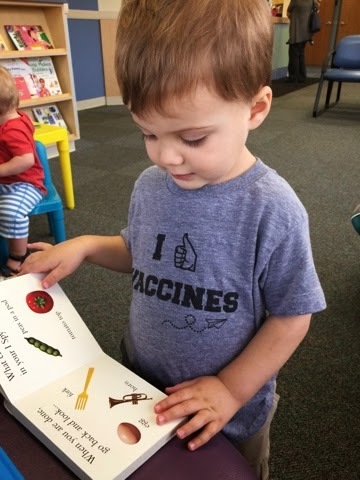 Anyways, I thought it'd be fun to have Patrick wear his vaccines shirt to his check up to see if any of the docs/nurses noticed it AND commented on it. Did they ever notice his shirt! Every.single.nurse. in the office came over to look at it and were absolutely loving it! Two nurses even asked if they could snap his pic in it--duh, of course! And I was like, "He's all over social media anyways, so post away if you'd like!" They really loved it. So Rosie's check-up was first and she rocked it--not one peep from her when her doc examined her. 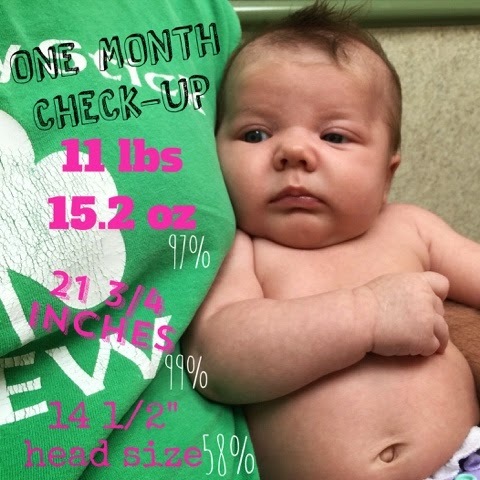 She got a sparkling report, and minus having an average size head, is chunking it up in the 97th and 99th percentile for weight and length--very similar to how her brother started off as well. Rosie had to get one shot, and after a teeny tiny scream, she was totally fine and actually conched out for an hour and a half (!!!) while Patrick ran around like crazy at the park. 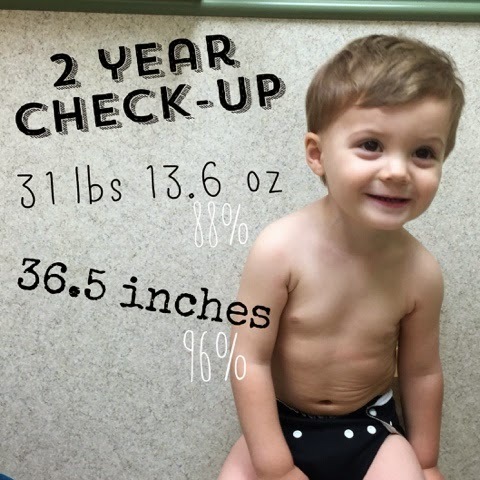 Patrick's 2 year check-up went swimmingly too! He's still maintaining his chunk status as well, and even though they stop measuring heads at 2 years I'm sure his noggin would have been up there too. We are very thankful for two chunky, healthy kiddos! Now that Patrick is 2, he can take regular medicine if he gets sick or has a cough or cold--this is exciting! No more Zarbees naturals (placebo????) for him. 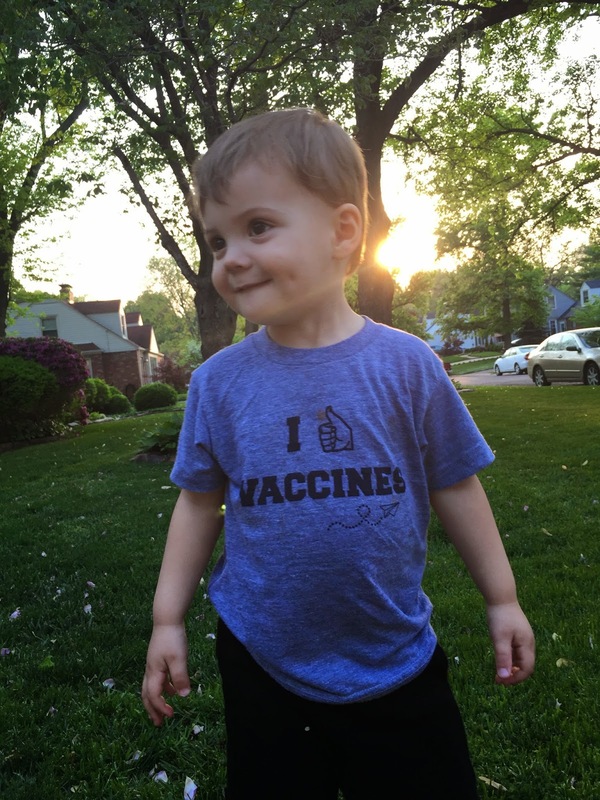 And, even though he wore his vaccines shirt, he actually didn't have to get any shots today! I know I read that he got a booster of something at 2 years, but I guess I misread??? because the doc said no shots for him. Oh well, his shirt was still a hit! Shockingly having 2 kiddos together for a check-up wasn't too bad with both Mike and I there. They both did great and, besides some post-shot from Rosie, no tears were shed. All in all both kiddos had very good check-ups and we are so happy and blessed we have two very healthy (and big!) kids! Can't believe Patrick at 2 is bigger than moriah at 3....little peanut girl of mine!